Working hours: from 9 a.m. till 5 p.m. 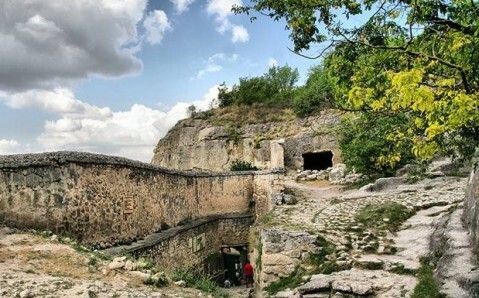 The ‘cavern fortress’ Chufut Kale is one of the most shining and the best-preserved medieval landmarks of the peninsula. 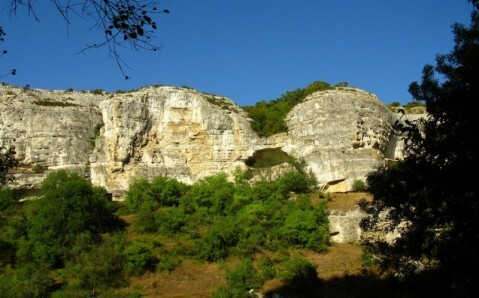 It is located near Bakhchisaray (around 3 km, or 2 miles) on a mountain plateau with precipices 1.5 kilometers (1 mile) above sea level. It may be said that nature created this fort, and people have only strengthened and improved its defenses. Historians are not unanimous on the time of the town’s appearance. Some consider it to have been a fortified settlement on the Byzantine border, founded in the 6th century and called ‘Fuly’ at the time. 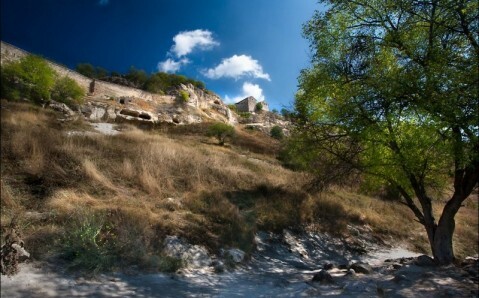 Others think that Chufut Kale appeared in the 11th century. It is first mentioned in historic documents at the end of the 13th century, as a settlement that was captured and plundered by the Golden Horde’s army. 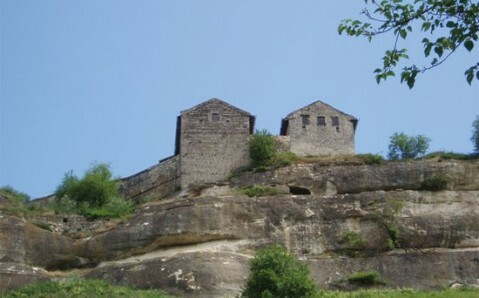 Over the next century, Chufut Kale was occupied by the Karaites. In the 15th century, Tatars renamed the town Kyrk-Or (meaning ‘forty fortifications’) and made it the capital of the Crimean Khanate. Residences of the first governors and the mint were located here, and the citadel was used as jail for high-ranked prisoners of war. Soon, Bakhchisaray became the capital of the Khanate and the Khan moved there with his court. 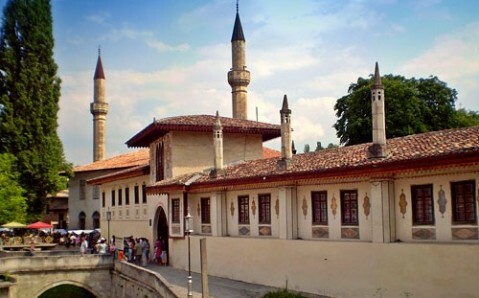 Almost the entire Muslim population followed him, and only Karaites remained in the town, because they were not allowed to settle in Bakhchisaray. Since those times the town was called Chufut Kale, which means the ‘Jewish Fortress’ (since Karaism is an offshoot of Judaism). In the 18th century, the Russian army destroyed the fortress and the town lost its significance. Karaites lived here for another century, and, after restrictions on their place of living were lifted, they left Chufut Kale for good. Nevertheless, a few buildings did remain in the medieval town that interest many of the peninsula’s guests. For example, the mansion of a prominent Karaite scientist and collector of the ancient manuscripts, Abraham Firkovich, is well preserved. Today, there is an exhibition about Karaite culture inside the mansion. 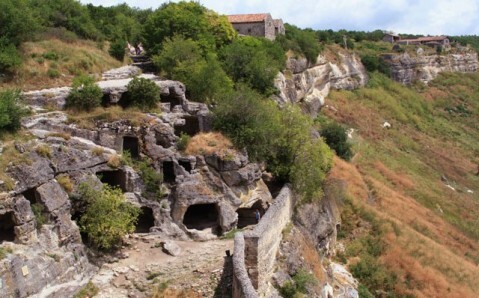 Moreover, you can find around 200 caves that were used by the locals for household and defensive needs. 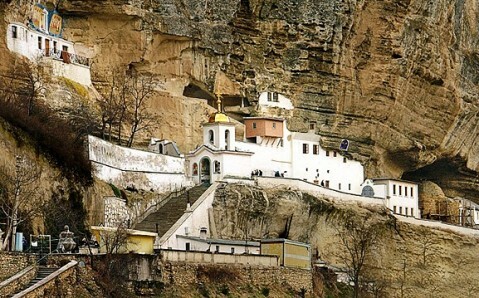 Some caves used to house churches, and today, you can still see remains of ancient frescos in them. 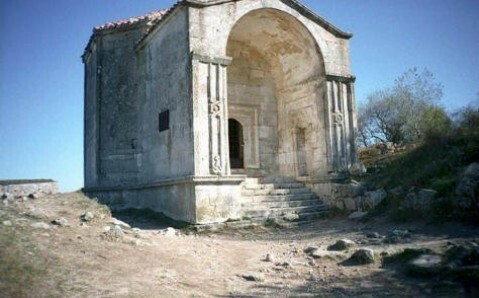 There are also remains of a medieval mosque, mausoleum of the Golden Horde Khan’s daughter, built in the 15th century, and two kenasas – Karaites’ prayer houses from 14th century. But the oldest landmarks in Chufut Kale are the wall that crosses the plateau and divides it in two parts, the old and new, and the remains of a few towers. Archeologists have recently discovered a magnificently preserved well on Chufut Kale’s territory. Getting here. You can take bus №2 from Bakhchisaray to the station ‘Starosel’e’ (‘Old Town’). From there you take a path to Chufut Kale’s Southern gate. You can request a guide for a group of no fewer than 20 people. Прекрасное место, как и все остальные такие места! Древние улочки, пещеры, посещайте в 5-7 часов вечера: не жарко, мало туристов, освещение лучшее для фото! По дороге много белок на деревьях. Великолепные виды! Лучше подниматься не по камням, а недоходя до маленькой лестницы пойти направо по песчанной тропинке - там и тень деревьев и рядом очень красивое караимское кладбище. Загадочный пещерный город. Нереально красивые пейзажи открываются. Можно долго бродить одному среди пещер и слушать только шум ветра и шорох травы. Время здесь остановилось. Носите спортивную обувь. На шлепки и каблуки смотреть больно. Вход 50 гривен!!! Берите с собой деньги. Город в скалах сам по себе интересен, но вид с этой высоты - еще более великолепен. Там в долине пролегает знаменитый шелковый путь. И каждый камень здесь имеет свою историю. 50 гривен с человека за просмотр пару развалин - это наглость! По дороге к Восточным воротам обязательно посетите обзорную площадку (табличка 0,3 км)! Место завораживает!!! Заехали на Тигуане к Восточным воротам. Дорога мягко говоря подубитая конечно, но проехать реально. УАЗик за 250 грн. нах не нужен! На разводки местных гидов не ведитесь! 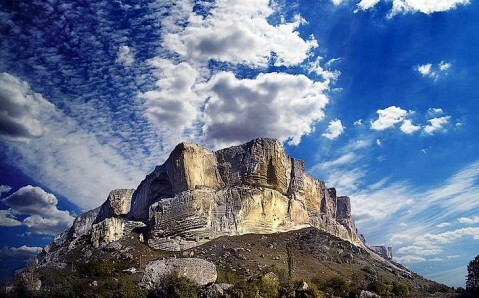 Rising 200m, this long and bluﬀ plateau houses a honeycomb of caves and structures where people took refuge for centuries. It’s wonderful to explore, especially (gingerly) the burial chambers and casemates with large open ‘windows’ in the vertiginous northern cliﬀ. These are truly breathtaking, as is the view into the valley below. To kalitero meros ...! Apisteutis arxaiologikis aksia kai apletis omorfias... Mono me tzip na pate...250 to tzip... 5 eisodos sto xwrafi...60 h' 40 sto mouseio..!!! An old town inside of rocs. Down stairs the is situated The Grate silk way. Третий раз здесь. Но впервые заехали к Восточным воротам на своем авто. У меня, оказывается, Вездеход. Очень красивое место и обязательно к посещению,пункт сбора денег после подъема к городу. Добраться можно самостоятельно без экскурсий.